Most people's blogs have specific purposes but as you can see from the title, mine doesn't. I just needed a place to write on "whatever" I want. Jesus conquered death and therefore we have great hope! I am supremely grateful to Jesus for his sacrificial death so that we may live with Him both now and into eternity. One day...we will be reunited with all that cheated death before us! Penny - I think about you every day. Your mark on my life is eternal. I love you and can't wait to see you again. Gretchen & the girls - I can't imagine life without you. You are my life! Gretchen - you are a rock and I am grateful for your patience and commitment to me. You pursue Christ with all of your hear, soul, and mind and your neighbors are constantly more important than you. You are a daily testament to the 1st and 2nd greatest commandments. 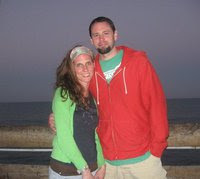 Family - I am blessed to have family on both my side and Gretchen's side that truly desire to follow Jesus. We miss all of you while our lives are primarily lived in MN but I know this life is just the beginning of an eternity where we will celebrate God together. Ministry - I wake up every day knowing how blessed I am to be called into a life of equipping the saints for the work of the ministry. There is no other way I would want to live my life. To have the privilege to lead people into a greater fullness of God is the most satisfying life I could ever imagine. Basketball - A sport I have always loved has become a strategic exercise for Kingdom building. Through playing & coaching I have met many that need Jesus in their lives that I would have never met without this sport. I love the game and I love teaching it! Mom & Dad - Thanks for your support. Dad - Your countless hours behind the scenes with Consumed is such a great assistance to me. I would be lost without you. Mom - your prayers for 36 + years have guided me into the man I am today. I will never understand fully the love of a mother but your actions have demonstrated them to me. I love you both! This picture may mean nothing to you but to me...mmm mmm goodness! I grew up in Ohio eating stadium mustard. Since I left for college I have not been home all that often. So for me to throughly enjoy my BBQ goodness I am reliant upon my wonderful mother to ship me my personal stash of the world's finest mustard. I have grilled about four times so far this spring without my beloved mustard. I would squeeze and squeeze my empty bottle with nothing but air and dirty mustard water leaving the spout. But today all that changed when my precious condiments arrived in the mail. When I opened up the package it took me about 2 seconds to know what I would be eating this evening. So here I sit typing this blog post as my Johnsonville brats are cooking to my left. I will feast this evening! For those of you that are interested, stadium mustard ranks much higher than Banana Nut Cheerios in my love of foods. 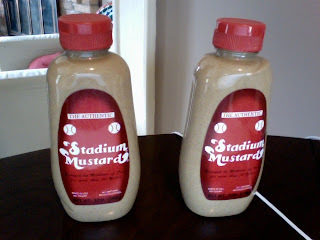 Stadium mustard actually cannot be compared to any cereal or other foods. It is an enhancer of all things grilled (minus steak). So in those comparisons I rank my beloved stadium mustard above all condiments. Higher than any BBQ sauce, fancy ketchup, or poser of a mustard that dares rival the tangy slash spicy goodness of this authentic brown mustard. I have been known to hide my beloved treasure when guests come over for BBQ's. I would secretly doctor up my brat while only putting inferior mustards on the table. I also used to not allow my girl's to use my supply. I felt as if they did not fully appreciate what their little taste buds were experiencing. Recently I have changed my ways. Gretchen has helped me see the complete selfishness of such acts (although I closely monitor the girls usage). So if you are over for a BBQ this summer, feel free to use what you need. My mom will keep me supplied and life will continue on smoothly. I am sitting in the emergency room with Mace right now. She will be fine. She is battling a little case of croup. Mace is seriously the best. Every time a nurse or doctor comes in the room she wins them over in about 3 seconds with that beautiful smile. But she is coughing and breathing heavy and sitting on a bed with a little heart monitor deal on her finger. That is tough for any dad to see. She looks over at me every now and again and says, with a raspy voice,"can we go home?" I tell her, "not yet sweety", and she pooches out her bottom lip and continues to watch tv. It can feel very helpless as a parent sitting in the ER knowing there is nothing really you can do to help your child. Just a few minutes ago I thought about my sister Penny and all the time she spent in the hospital the last few months of her life. When my dad visited her he told me several times how helpless he felt. As a dad, you are willing to do anything to protect your daughter and yet he couldn't do anything to stop that horrible disease from spreading. The thought of my dad and Penny led me to thinking about what this day represents. The day we set aside to remember and reflect Jesus' death and the ramifications of that death for us. Rightfully so, on Good Friday we think and reflect mostly on Jesus - His arrest, trial, flogging, sufferings, pain, anguish, and death. 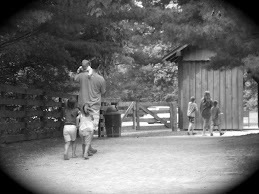 But this morning I gained a new perspective...a Father's perspective. I can't begin to imagine what our Heavenly Father felt when His only Son endured the most horrific of deaths. God selflessly sacrificed His Son (and Jesus was willing to do it), so we could be reconciled as His children. I wouldn't give the life of one of my daughters for anyone. But God...His love for humanity reached a level unparalleled by anyone or anything! "For God so loved the world that He GAVE His only Son. That whoever believes in Him should not perish but have eternal life." Today that familiar verse resonated with me in a different way. I am so appreciative of the work of God on humanity's behalf. Today I celebrate a new life given to me but at the cost of a Father allowing His Son to suffer. Happy Good Friday everyone! God truly loves you more than you can imagine! I can't really believe it has been one year since I wrote THISPOST (scroll down to the final one with the date February 7). That ended up being the last time I saw Penny alive. I tried my best to get home later that week when her health failed rapidly but I was about 4 hours too late. This past week I have thought a lot about my time in Ohio those 8 days In many ways I saw Penny slowly exiting this life. There were great moments amongst the sorrow and aguish. I treasured every night Katie, mom & dad, Polly & Tim, and Dustin & I would sit in the living room with Penny. I am not sure she had any idea we were all there but we gained strength from each other just being together. A lot has changed this year but one thing has not - God is still as faithful today as He was 12 months ago. I praise Him for that. Life here in MN is grand. The girls continue to get bigger. As you have most likely read from Gretchen's Blog our family did get a Wii. This does provide a source of entertainment and trash talking. Yes...I trash talk to my 9 and 8 year old in Wii tennis. Tori and I have quite the rivalry. She beats me occasionally and gets cocky. Then I have to silence her with my wicked forehand. I am in the midst of a p90x adventure which means I am doing things like kickboxing and yoga for the first time. That is a sight to see I am sure. I will spare you the before and after pics. Not sure if they will look all that different anyway. Gretchen enjoys mocking me as our fearless leader Tony Horton yells random statements like "it's p90x" and "bring it" about 75 times per video. Oh...in case you haven't noticed OSU's basketball team is #1 in the country and the only remaining undefeated team. They are an exciting team to watch. They really have it all - post play, outside shooting, veteran leadership, exchangeable defensive players, and a hunger to win. I am hoping for a deep run into the tournament. My hero is my ant. She died when I was in 1st grade. She helped me learn. She helped her daughter learn. She put people in front of her. My mom and dad were very sad so was my sister. My cousin got a bild a bear with my ant talking. my mom and dad are still sad. She would always be there for me i mis her to. If she was hear everybody would be happy. she will always be by my side and that is way I miss her so much. I wish she was hear. She could teach me some more. She was a ture hero! My favorite sports are basketball and swimming. My favorite team is the Bukies. I like them because my dad is from Ohio and we cheer for the Bukies! My name is Isabelle Miller. I have brown eyes. I am funny. I have brown hair. I am small. I have two sisters named Tori and Macie. My dads name is Jame. My moms name is Grechen. My friends are Ramya and Emily. My other friend is Rachl. We like to talk. We like to draw. I like m and m's. I like ice cream. My favorite animal is a clown fish. I am in second grade. If I had 3 wishes I would wish for a car, a hundred Zuzu pets and a dog. I want to go to Disney World. 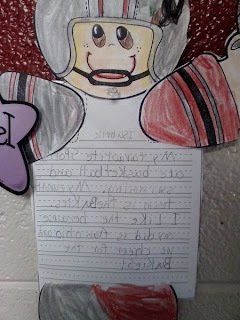 My teacher is Mrs. Seaberg. I am a supper math star. I got my math test all right. I'm working on my math facts with my mom. My older sister is great reader. She is in 4th grade and a 5th grade level. My little sister is a littel fighter. she will get on the floor and kick you and kick you! My mom is right about journling. She can do it for a long time, I mean a long time she can do it for an hour. It is amazing how she can sit there for a long time. My dad works for Consumed Ministries and Normandale. We go to cook outs at our friends hose. Now you know about me and my family and my friends so we bye for now. This morning I asked Isabelle if I could post these things. At first she was reluctant but I told her there were people that would love to see what she is doing in school. So thanks for reading. As I say often Isabelle is my "little Gretchen". I didn't know my beautiful wife when she was younger but I am privileged to get a little glimpse into some of what she may have been like by raising her daughter! Dead Sea Scrolls - The Science Museum in St. Paul has had a Dead Sea Scrolls Exhibit for the last several weeks. There is only two weeks left. This past Friday evening Gretchen and I took the girls. I was very impressed with this exhibit and I strongly encourage you to go if at all possible. Tickets are a little pricey but if you can afford it or can locate cheaper tickets you should go. They have plenty of things to look at and it the exhibit includes a self guided audio tour for both children and adults. The exhibit became a spiritual experience for me and I found myself in awe of God once again as I looked at these ancient pieces of Scriptural texts. Macie: Look dad. It's Aunt Penny. Lydie's mom. Me: Yes it is Mace. I really miss Aunt Penny. Macie: But Aunt Penny died. Dad, when people die they do this (Macie lays down and remains very still). Me: I know that is what her body does Macie. But we can be happy because we know that Penny's soul is now with Jesus. Macie: But dad, we need to go get Aunt Penny and bring her back to her house. Me: We can't do that Macie. She is with Jesus now and we just have to do our best to remember the times we had with Aunt Penny until we go to see Jesus and see her again. It always amazes me at the conversations you can have with kids. I am glad my little girl knows her Aunt Penny! I am blessed by God with a wonderful wife and three beautiful girls. I live in the Twin Cities but will always be a Buckeye. More than anything, I enjoy engaging people over a meal or a great cup of coffee. Head To My New Site! In His Strength; for His Honor.